FBI Director James Comey may not exactly be the wholesome Boy Scout some attempt to depict him as. By all appearances, he has been in the camp of slimy leftists like the Clintons and Barack Hussein for many years. Comey’s supporters on the left may try to deny any connection, but they can’t deny history. Let’s examine Comey’s resume. According to 21st Century Wire , much has been made recently about the FBI and the Department of Justice letting off favored presidential candidate Hillary Clinton for admittedly mishandling classified information and using her own private email servers to do state business during her time as US Secretary of State. 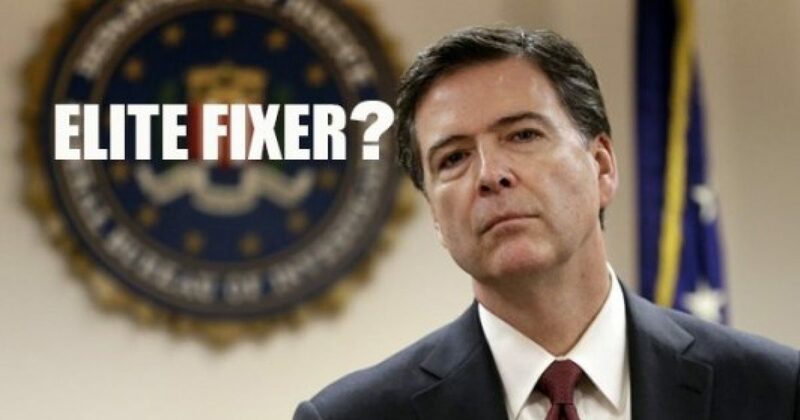 FBI Director James Comey was manning the key choke-point in the decision to not hold Clinton accountable for what so many before her have received convictions for. What many are not aware of is the political and organizational links between Hillary Clinton and James Comey behind the curtain of international high finance. “Hogan & Hartson in Virginia filed a patent trademark request on May 19, 2004, for Denver-based MX Logic Inc., the computer software firm that developed the email encryption system used to manage Clinton’s private email server beginning in July 2013. A tech expert has observed that employees of MX Logic could have had access to all the emails that went through her account. Many will also be unaware that before Comey was installed by the Obama Administration as FBI Director, he was on the board of Director at HSBC Bank – a bank implicated in international money laundering, including the laundering of billions on behalf of international drugs and narcotics trafficking cartels. “If Comey, and his boss Attorney General Alberto Gonzalez, had made a different decision about KPMG back in 2005, KPMG would not have been around to miss all the illegal acts HSBC and Standard Chartered SCBFF +% were committing on its watch. So according to the establishment narrative, Comey is the who will “keep an eye on the banks” and “help stamp out corruption,” while the opposite seems to be happening. Has Comey been put in place to stop corruption, or to enable it? His record certainly warrants some study on this point. It seems that our beloved FBI Director is or until very recently was a director and board member of HSBC, which is tightly connected to the Clinton Foundation. It’s like a revolving door of money and special projects that the bank and the CF are involved in. This is the same HSBC that was accused of laundering drug cartel money, was heavily involved in the LIBOR scandal, and who knows what else, and all the while our esteemed FBI Director James “she didn’t intend it” Comey was part of the senior leadership.